Hampton Inn and Suites East Hartford offers spacious rooms equipped with flat screen TV’s, free Wi-Fi, and plush bedding. Downtown Hartford is a 7-minute drive from the hotel. Cable TV with HBO channels is available in every room along with a work desk and a coffee maker. Rooms offer a sitting area with sofa beds available in select rooms. This Hampton Inn also features a hot breakfast and a 24-hour fitness and business center. Guests can also lounge on the outdoor terrace. Mark Twain House and Museum is 2.8 miles away and the Hartford Stage is a 5-minute drive from the property. 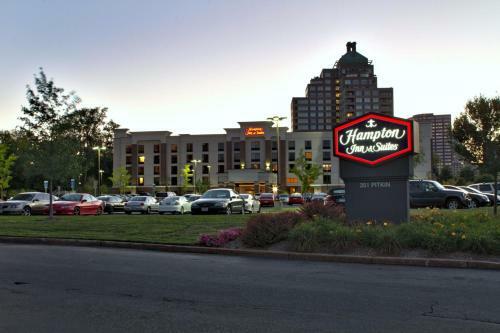 the hotel Hampton Inn & Suites East Hartford so we can give you detailed rates for the rooms in the desired period.